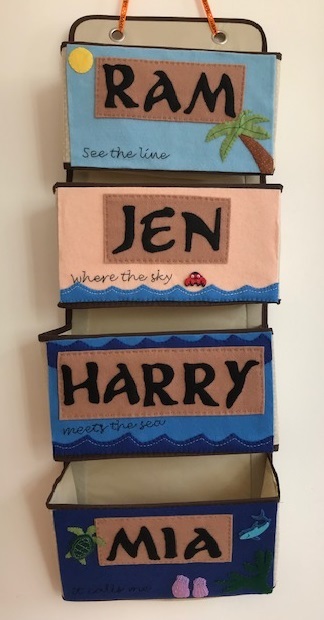 I love sewing and have enjoyed lots of crafty sewing projects over the years, so I was naturally keen to share this with my children. Sewing does require quite a bit of skill and manual dexterity, so it takes a little while for a child to be able to manage sewing with a needle and thread. I saw this gorgeous toddler friendly sewing basket online a little while ago, and it inspired me to think about how I could introduce a toddler to sewing before they could be trusted with a needle. I was in the supermarket, and I found this sink mat in the sale - something like this sink mat (affiliate link). It's light, easy to hold, and has plenty of large holes, and I thought that it would make a nice sturdy basis for Harry to thread some yarn through. I made a needle with a pipe cleaner, so that I could bend it around the coloured wool. I also tied a second pipe cleaner to the end of the wool so that it couldn't be pulled through. I let Harry watch while I started sewing, and of course he was desperate to have a go himself. He was intrigued by the process, and concentrated very hard on threading the wool through the holes. He was a bit sporadic in his placement of the thread but that didn't matter, it was all about the process. As he gets older I will add different things for him to thread through. I'm thinking about trying weaving and sewing other items on like perhaps large buttons. If you want to try something similar with your child you might also enjoy this post from Tinkerlab - Even Toddlers Can Sew - which you can do with materials from around the house. You might also want to hone those fine motor skills with a selection of items for threading in a threading busy bag. If you have an older child that has shown an interest in sewing and is ready to make their first project with a needle and thread you might like our simple first sewing project - lavender bags. 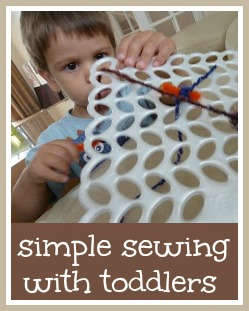 Wonderful post - I have added it to my sewing with kids board as well as the Baby and Toddler play board on pinterest.